Dramatic changes in pressure affect your ears and sinuses. You might have experienced ear popping as an airplane descends, for example. As you descend to begin a dive, the pressure increases dramatically with increased depth. Water will press against the eardrum until you can open the Eustachian tubes to equalize your ears. If your ears fail to equalize, or if you try to force them to equalize, the pressure can cause damage or injury. Enter the water feet first to avoid irritating the Eustachian tubes and making it more difficult to equalize your ears. Entering the water feet first will also reduce your risk of slapping your ear forcefully against the surface of the water. Once in the water, begin equalizing your ears early. As you make your descent, equalize your ears every few feet. If one ear remains blocked, tilt your head with the blocked ear reaching toward the surface. This tilting can help you clear a stubborn ear. If you still cannot clear your ears, go back up a few feet to a lower pressure to try clearing again. Do not try to force your ears to clear, and do not continue diving if you cannot clear your ears. 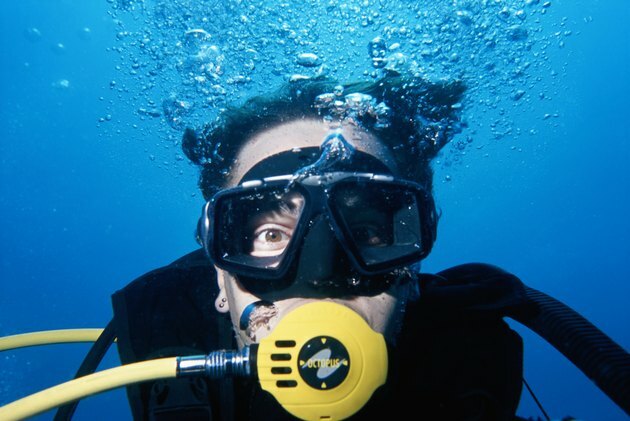 Divers use different methods to equalize their ears. You can try a combination of methods if that suits you best. To use the Valsalva maneuver, you must close your mouth, pinch your nose and blow gently. To do the Frenzel maneuver, close your nose and mouth and push your tongue against the roof of the mouth. The resulting muscle contraction should open your sinuses and Eustachian tubes. Many divers can also open the Eustachian tubes by simply swallowing, making a yawning motion or moving the lower jaw back and forth. If congestion obstructs your Eustachian tubes, you might have more trouble equalizing your ears. Thus, if you have a cold, you might find it impossible to equalize your ears. Don’t allow cold medicine or an hour of reduced congestion to lull you into false security. Even if you experience easy equalization on the descent, your congestion might return during the dive. You could then experience the “reverse squeeze,” in which you have trouble clearing your ears as you return to the surface. Eardrum pain, known as myringitis, can occur if you jump into the water from a boat or dock and slap your ear against the surface of the water as you enter. If you make overly violent attempts to clear your ears to compensate for pressure changes, you can also cause eardrum pain. Don’t try to force your ears to clear. If, after gentle attempts to clear your ears, your ears remain blocked, consider aborting the dive and returning to the surface. Air spaces in the sinuses and ear can expand if the ears do not properly equalize, causing an injury known as barotrauma. Mild symptoms of barotrauma include pain and pressure in the ear. More severe symptoms include ringing, hearing loss, nausea and dizziness. If you experience more severe symptoms of barotrauma, do not continue to dive. Consult a physician. If you try to force your ears to equalize by blowing your nose too hard, you could blow out your eardrum. In extreme cases, the pressure can force a hole to form in the inner ear. This damage, known as perilymph fistula, could result in hearing loss, dizziness and other serious complications. If you believe you might have ruptured your eardrum, or if you experience sudden dizziness, hearing loss or ringing in your ears, seek medical help immediately. Contact the Divers Alert Network for assistance. Can You Swim After You've Had a Burst EarDrum?